Al Kaline baseball cards are some of the most sought after vintage cards in the hobby. Ernie Banks was “Mr. Cub”. Tony Gwynn was “Mr. Padre”. And Al Kaline was “Mr. Tiger”. Which is quite a title given that Ty Cobb and Hank Greenberg were both Tigers as well. There were few players who could hit, field, run and throw as well and as consistently as Al Kaline. For just over two decades, Kaline gave Tigers fans someone to depend on. Al Kaline baseball cards are coveted not just by Detroit Tigers fans but by baseball card collectors far and wide. Here is a list of 22 of Kaline’s most important baseball cards in the hobby. Although Kaline's Major League debut came on June 25 of the 1953 season when he replaced Jim Delsing late in the game that day, his rookie card is officially the 1954 Topps #201 issue. Kaline's rookie card is one of three key rookie cards in the 1954 Topps set, the other two belonging to Hank Aaron and Ernie Banks. The card design features a nice head shot of Kaline alongside a black and white image of him kneeling on one knee. Because of the way these were printed, sometimes you'll notice a variance in color in the background, ranging from a deep red to an almost orange color. 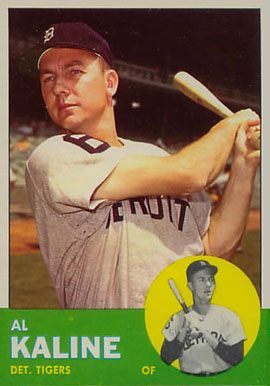 Topps would buy out Bowamn in 1956 so the only vintage Bowman baseball card to feature Al Kaline is the 1955 Bowman #23 issue. The card design is instantly recognizable for its famous television-set-framed image of each player and brown borders. Collectors are treated to a nice image of Kaline standing ready at the plate. Topps would take the same head shot image it used on its 1954 Kaline baseball card and use it again on their 1955 issue. The horizontal card design was a first for Topps that year in a set that featured key rookie cards of Sandy Koufax, Roberto Clemente and Harmon Killebrew. 1955 was arguably Kaline's finest year as he would post his highest single season totals for both runs scored (121) and batting average (.340) while becoming the youngest player to ever win a Major League batting title that season. Print defects and poor centering are usually the top two condition issues that you'll come across for this card. Same head shot again. Topps just didn't have too many photos to choose from in 1956. But, oh well, the card is still sharp and features a nice action shot of the young Kaline running towards home. 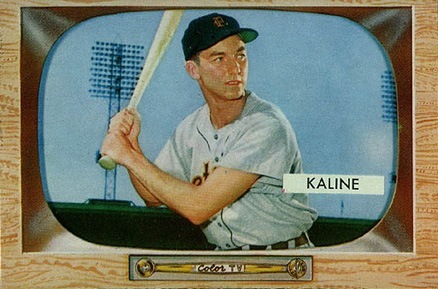 Like all 1956 Topps cards, Kaline's card isn't as glossy as the year before and the images can appear a bit more grainy. Al Kaline's 1956 Topps baseball card may not be as coveted as the Mickey Mantle and Ted Williams cards of the same set but many collectors still hold it near and dear. In 1957, Topps would introduce the 2-1/2 by 3-1/2 inch dimensions and full career player statistics on the card backs that we are now used to as standard in the hobby. The card displays a nice, full image of Kaline standing at the bat showing off his famous number 6 across his back. Kaline would win the first of ten Gold Glove awards in 1957. Centering and chipping can sometimes be an issue with this card but it is no doubt one of Kaline's more desired cards. Most 1958 Topps baseball cards were printed with players' names appearing in white lettering across the top. However, there are a few exceptions where some cards were printed as variations with the players' names appearing in yellow, too. Kaline's card was one of those exceptions. As you can see below, there are clearly two versions of the card with the yellow name variation commanding a significant price premium versus its white name counterpart since it is more rare. Al Kaline's 1959 Topps baseball card features a nice, encircled frontal shot of the legendary Tiger swinging through a pitch. He missed several games in 1959 after suffering a fractured cheekbone after being hit by a thrown ball. That didn't prevent him from putting up one of his better statistical seasons having hit .327 with 27 home runs, 94 RBI and 86 runs scored. 1960 was a down year statistically for Kaline as he hit only .278, with 15 home runs, 68 RBI and 77 runs scored in 147 total games. Nor did he take home a Gold Glove that year either. Still a fan favorite though, many kids scrambled to collect his 1960 Topps issue. The card features the signature action shot of the set of Kaline along the left side with a nice head shot of him staring off into the distance along the right side. Centering issues usually prevent this issue from receiving higher grades. 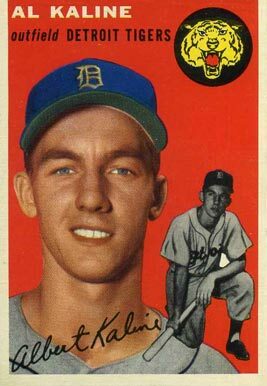 Kaline led the 1961 Detroit Tigers to 101 wins that season but amazingly that was still 8 games short of the New York Yankees. Mickey Mantle and Roger Maris's famous home run sprees proved too much for everyone else to handle that year. Kaline's 1961 Topps baseball card is easier to find in higher grades than his other issues due to far fewer centering and chipping issues relative to other sets of the day. The card shows a nice, large image of Kaline smiling and looking off into the distance. The 1962 season saw Al Kaline start off on an absolute tear batting .345 with 13 home runs and 38 RBI in just 35 games. He broke his collar bone catching a ball hit by Elston Howard on May 26 that season, however, and missed the next 57 games. Who knows how long he would have been able to keep up that pace? His 1962 Topps card features a very nice shot of Kaline swinging the bat surrounded by the famous wood-grain borders of the set. Centering can be an issue for collectors as well as chipping given the aforementioned border styling. Looking to bounce back in 1963, Kaline would do quite well and finish second in the American League MVP voting to none other than Elston Howard. Howard's fly ball ended up in Kaline breaking his collar bone the year before and apparently he wasn't done punishing Kaline! The 1963 Topps Al Kaline baseball card presents nicely as a smaller, encircled image of Kaline on a yellow background sits imposed upon the main card image and green border at the bottom. The 1963 Topps set was notorious for tilting and centering issues as well as the occasional print bubbles in the bottom borders. Foot pain brought on by a condition called osteomyelitis started to give Kaline a lot of problems in 1964 but he respectably played out the entire season anyway. Unsurprisingly, his offensive numbers would suffer as his batting average dipped to .293 and his slugging percentage dropped to .469. That didn't stop him from collecting his 7th Gold Glove award, though. His 1964 Topps baseball card is dominated by a large, bold head shot of him staring off into the distance. The "Tigers" team name sits on top of the card in big bold letters giving the card a very straightforward and serious feel overall. With the help of an orthopedic surgeon, Kaline was wearing corrective shoes in the 1965 season to help with the continued foot pain. The shoes helped ease the pain and he would win his 8th Gold Glove that year but his offensive stats were as uncharacteristic as the year before. His 1965 Topps issue offers a great shot of him with a bright, big smile in front of a bright blue sky. Centering and print bubbles along the colored borders of the images are the most common issues for collectors. Mr. Tiger bounced back well in 1966 batting .288 with 29 home runs (his highest single season total), 88 RBI and 85 runs scored. His 1966 Topps baseball card presents a nice image of him swinging while the Tigers team name sits atop a yellow banner in the upper left and his name and position atop a yellow banner at the bottom. After a strikeout in a frustrating loss to Cleveland during the 1967 season, Kaline broke his hand while slamming his bat into the bat rack. Despite missing 31 games that year, Kaline hit .308 with 25 home runs (including his 300th) and 78 runs batted in while winning his 10th and final Gold Glove. Collectors of the 1967 Topps set like the cards for their simplicity, picture quality, and great rookie cards. If you look closely at the top of Kaline's 1967 Topps baseball card you'll notice something unusual. 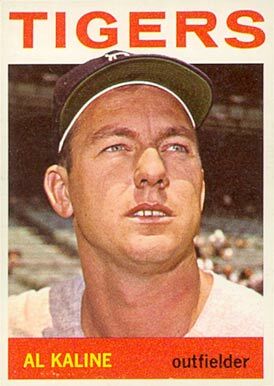 1967 Topps baseball cards were printed across six series and for whatever reason, series one cards like Kaline's did not feature the small dot between the player name and position at the top. During the 1968 season, Kaline would miss significant time due to a broken arm. In his absence, Jim Northrup took over right field and played well enough that when Kaline returned, he was used mostly as a pinch-hitter and to help fill in at first base. Despite operating as such and making it to the World Series to face the St. Louis Cardinals, manager Mayo Smith then made what ESPN has called one of the ten best coaching decisions in sports history. To make room for Kaline in right, Mayo removed Ray Oyler, put center fielder Mickey Stanley at shortstop and moved Northrup over to center. The Tigers eventually fought back from a 3-1 deficit and sealed the championship in Game 7 over Bob Gibson. Kaline did not win World Series MVP but was crucial in winning the championship after turning in a batting average of .379 with 2 home runs and 8 RBI. His 1968 Topps card offers a simple and straightforward look at Kaline bordered by the famous burlap-coloring of the '68 set. Kaline would hit over 20 home runs in a season for the last time in 1969 as he finished the year with 21. His 1969 Topps baseball card displays a nice frontal shot of him swinging the bat much like his 1967 Topps card. Tilting and centering can be condition issues for collectors of this and other 1969 Topps baseball cards. It's hard to describe the look on Kaline's face in his 1970 Topps issue. Some collectors believe the 1970 set to be rather plain and boring. The gray borders and fairly straightforward design being the culprits. Kaline's 1970 card is very bland compared the rest of his cards but true Kaline and set collectors easily put that aside and love this one all the same. Al Kaline became the first Detroit Tiger to sign a $100,000 contract. He had turned down a similar contract the year before because he felt his play didn't deserve it--something you likely wouldn't see happen today. Kaline's 1971 card features the famous black borders that often present chipping and wear issues for collectors. The card is pretty neat overall, featuring the Tigers team name in big, bold yellow letters up top with a nice shot of Kaline below. That famous 1972 Topps design is instantly recognizable on this Al Kaline baseball card. Kaline hit over .300 for the last time that year finishing the season with a .313 batting average in 278 at bats. The psychedelic card design is almost comic-book-like but no doubt shows that Topps intended on a design that reflected the times. A nice shot of Kaline leaning on his baseball bat. The absence of his position (and all players' positions in this set) on his card was a very unusual move for Topps. Winning the Roberto Clemente Award in 1973 is no doubt one of Kaline's finest honors. The tragic death of Roberto Clemente in 1972 left a hole in baseball's heart. But the league did a great thing in honoring the legend by naming such a fine award after him. The 1973 Topps card design is kind of cool, really, as it's pretty straightforward but has enough pizzazz to keep it fun. Kaline batted a career low .255 in 1973 and failed to play in more than 100 games in a season since his debut late in the 1953 season. On September 24, 1974, Kaline joined the 3,000 hit club becoming just the 12th player in MLB history to do so at the time. After reaching the milestone, he announced that he would retire. No longer would Detroit fans be treated with the amazing play of their beloved right fielder who had graced the field for over 20 years. Kaline's 1974 Topps baseball card shows Kaline playing first base flanked by the Detroit Tigers team name at opposite corners of the card in nice red banners. Al Kaline was a Detroit Tiger legend and the team honored him as the first of their players to have his uniform number (6) retired. In 1980 he would become the tenth player in history at the time to be inducted into the Baseball Hall of Fame in his first year of eligibility. Kaline received 88.3% of the sportswriters votes, appearing on 340 of the 385 ballots. Al Kaline finished his 22-year big league career with 3,007 hits, 399 home runs, 18 All-Star appearances, 10 Gold Glove awards and one World Series championship. In 1955, at just 20 years old, Kaline also holds the record for being the youngest player ever to win a single season batting title. Mr. Tiger will perhaps always be best remembered for his all-around skill set. Manager Billy Martin once said, "I have always referred to Al Kaline as 'Mister Perfection'. He does it all – hitting, fielding, running, throwing – and he does it with that extra touch of brilliancy that marks him as a super ballplayer... Al fits in anywhere, at any position in the lineup and any spot in the batting order."